It is time to get real again. Real with yourself. There is a quote that has been following me around for days now. I follow a lot of inspirational motivational social media accounts* and almost all of them have posted the same quote. Which led me to do some reading and investigating about the concepts stated in it. The quote is by John C. Maxwell, most of you will know it. 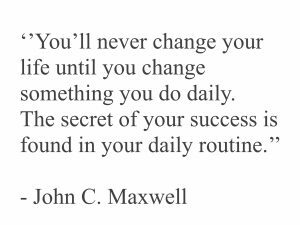 Even though routines drive me crazy, I cannot help but think that there is a form of truth in this quote. I mean when I started making little changes a lot changed unintentionally. I actually did change what I do on a day to day basis. I added and subtracted till I came to a happy point. Even now, I am still messing with that equation. Whether that all will lead to actual success is another argument to fight about. I do however think that if something in your daily routine is blocking you from reaching your goal then it is worth finding out about. By watching various videos and reading articles about him it became clear, I think, what he is talking about. He means that when you work on your goals, or actually your plan to reach your goal you will become a success. I agree, that is the sole reason why I break down all my goals into plans that I work on daily. However when I first read the quote I thought about it differently. 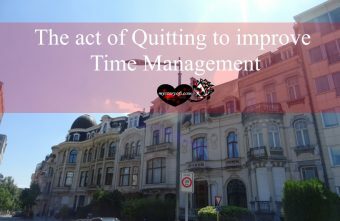 I thought about it as in finding ways to work more efficiently, smarter, keeping yourself motivated etcetera. I figure that there are more ways of thinking about this. I understand what he means and agree with him but when thinking about this quote I was also thinking about bad habits. They are also, often, something you do daily. I cannot imagine that they will lead to success. Seeing that they are called “bad habits“. It is obvious that they are or could be standing in the way of me reaching my goals. Now changing habits is hard. We are so used to some of them that we do not even notice that we are doing it. Now getting rid of them completely would be fabulous but I am human so fear that this is not possible. Instead I can try to get them at the lowest point possible, I think then there is a chance I might be working towards my goals better than I am now. Time to get real. I focussed on my little personal annoyances about myself. I wrote them down. I thought about the things I am fully aware that are not helping My Story Of I. Terrible is it not? I am aware that it is bad yet I still do it. Continuing, I kept tabs during the week on what went wrong and why. I wrote everything down. I categorized everything in actions and under that I wrote down why it was a bad habit. The why is important because it made me aware. Consciously aware. Be honest in this, get real, you are helping yourself become a better you for you. Now that I know and am consciously aware, the next part is discontinuing the bad habits which you can find here. *Credits go to them for inspiring me to write this.